The Scoop & Learn Ice Cream Cart lets you create a variety of imaginative and tasty-looking ice cream combinations using four flavors of ice cream, three toppings and three syrup flavors. Use the magic scooper to scoop up the ice cream and toppings to build customer orders and it will recognize the colors and flavors. Then press the pump to add pretend syrup while counting to ten. Build memory and sequencing skills by choosing from six cute animal order cards and following the instructions. Ring the bell to let them know their order’s up! Playful phrases introduce colors, numbers, flavors and more while you explore the cart’s features and six activity cards. When you’re ready to move to a new location, place the accessories in the correct places or put them in the two storage drawers and push the cart around to hear upbeat songs and music. Other products from WOWWEE GROUP LTD.
Hatchimals only hatch once – and now they’re hatching in a whole new way! Use your love and care to help them along! Hold, rub and tap the shell of your egg and you’ll hear delightful sound and see glowing eyes! Once the eyes flash rainbow colors, it’s hatching time! Your first Hatchimal twin will push, push, push until it cracks the eggshell! Lift out your first Hatchimal, and reach into the egg to lift out their twin! They’re finally here! Unwrap L.O.L. Surprise!™ balls to find mystery collectibles with every layer: 1st Layer: Secret message [shhh . . .] 2nd Layer: Emoji stickers [so many feels!] 3rd Layer: Baby bottle [heyyyy, it's also a charm] 4th Layer: Pair of kicks [roller skates, cowgirl boots, ballet flats and more] 5th Layer: Outrageous outfits [jumpsuits, tutus, leather jackets, mermaid tails and more] 6th Layer: Fashionable accessories [sunglasses, cat ears, tiaras, oh my!] 7th Layer: … finally! L.O.L. Surprise!™ 3-inch doll—the ultimate surprise! These dolls are fierce, fashion-forward and packed with personality. From rockers to divas to merbabies, L.O.L. Surprise!™ has collectability all rolled up in a ball playset and purse. But the surprise doesn't end there. Feed your doll water with the baby bottle and reveal ANOTHER hidden surprise! "L.O.L. Surprise will be the hottest stocking stuffer this season," said Isaac Larian, CEO of MGA Entertainment. "Children today are obsessed with unboxing, the element of surprise and collectibles. To them, L.O.L. Surprise isn't just another toy. It's an experience, a hidden mystery, a present they can unwrap again and again every day to build their L.O.L. Surprise collection." Collectibles are the kid currency of today where sharing and trading with friends on the playground is like being part of a special club. Not to mention, the accessible price points allow parents to easily get on board with the trend that isn't going anywhere anytime soon. With an MSRP of $7.99, L.O.L. Surprise!™ is perfect for both ordinary and extraordinary occasions. L.O.L. Surprise!™ is THE only collectible that provides the ultimate unboxing experience, bringing the element of surprise with every layer!! Fold the box to make the projector, add the lens and place the smartphone. Project videos on the wall. Other products from LEARNING RESOURCES INC. The race is on to build hands-on coding skills! Build your maze, and then use the coding cards to create a step-by-step path for Colby, the Programmable Robot Mouse. Program the sequence of steps, and then watch Colby race to find the cheese! This deluxe set includes 30 double-sided coding cards, 10 double-sided activity cards, cheese wedge, and Activity Guide to provide the perfect hands-on introduction to coding concepts. Create your path with 16 maze grids to create a 20" x 20" maze board, 22 maze walls, and 3 tunnels for endless possibilities. Colby lights-up, makes sounds, and features 2 speeds along with colorful buttons to match coding cards for easy programming and sequencing. Add multiple players with Jack, the Programmable Robot Mouse (LER 2841), sold separately. Colby measures 4"L and requires 3 AAA batteries (not included). Have fun with Georello Junior, making all the colorful gears move by turning one gear with just one figure. Create a chain reaction that surprises and involve children in endless experimentations. Includes one clear base, nine colorful gears and nine matching discs. 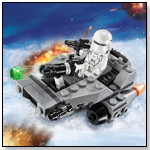 Deliver passengers in the Resistance Troop Transporter with opening hatches, lowering ramp, dual flick missiles and space inside for the 4 minifigures included in the set. 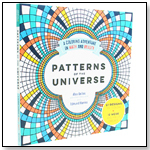 Contemplate the Patterns of the Universe as you color! Math is at the heart of many natural wonders and has an abstract beauty all its own—in the silhouette of a snowflake, the spiral seeds of a sunflower, and the symmetry of the Sri Yantra mandala. From the 4-D hypercube that casts a starlike shadow, to the infinite pattern of Penrose tiles that never perfectly repeats, these 57 exquisite designs reveal their secrets as you fill them with color. Art becomes an act of discovery—no math knowledge is required! In the bonus Creating section, as you join dots, flip coins, and follow other simple steps, 12 surprising images will emerge before your eyes. This is an adventure for all ages—and a treasure for artists in Numberland! Other products from KIDS PREFERRED INC. The most durable and deluxe tractor around, this John Deere specialty item offers great details and great adventure for little builders. Ages 8 and up, 8 x 9 x 13.5 inches. Customize this chalkboard tote with your own unique designs using the chalk markers. Then use the sponge eraser to erase and start again! Kit Includes; chalkboard keeper tote, 3 chalk markers, sponge eraser, and instructions. Other products from OHIO ART CO.
You don't have to be an engineer to create with Nano Blocks. 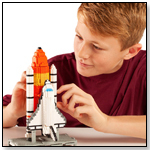 With these micro-sized building blocks, a 3D Space Shuttle is constructed like never before. Watch in amazement as the Shuttle is erected to even the tiniest detail. With over 1600 assorted size pieces, create a detailed replica of the Space Shuttle, that fits perfectly in the palm of your hand. Includes detailed color instructions. Not designed for children under age 8. This would be a great addition to any collection and a perfect gift for any inspiring designer, architect or collector. Drive back the enemy with the First Order Snowspeeder™ featuring three-man crew, storage, stud shooter, rapid-fire shooters, hidden wheels and more. Coloring Crush includes everything you need to make dreamy, just-add-color works of art. And, for those who can’t find the pointy end of a pencil, our introductory how-to guide includes a crash course in using colored pencils, blending and layering, color scheme inspirations and artist-approved techniques. Sharpen your skills at Adventure Camp Archery with a bow with shooting function, knock-over target, rest shelter and a hedgehog. Includes a Mia mini-doll. 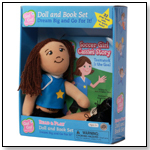 This Read & Play includes: your very own Soccer Girl Cassie doll with her soccer ball, backpack, and towel, and a fully illustrated story book. Children find out who wins the big game as they learn fun facts about soccer in this entertaining story written for beginning readers. Awarded Dr. Toy's 2014 10 Best Award and Oppenheim Toy Portfolio's Platinum Award. Go! Go! Sports Girl products are designed as a fun and educational way to promote self-appreciation and the benefits of daily exercise, smart eating and sleeping habits, self-esteem, and overall healthy life skills for girls. The books and dolls in the series encourage all children to dream big and work hard to achieve their goals—and have fun while doing so. The Gradient Puzzle is a vibrant way to meditate on color. The act of putting it together is slow and deliberate, where the color of each piece is used to locate its proper position. We’ve used a thick stock and high quality art paper, so the puzzle can be assembled again and again without losing its edge. The 37 Key Digital Baby Grand Piano is a twist on Schoenhut’s traditional baby grand pianos. Same patented body design, same sturdy structure, but we’ve added some enchanting design elements, and plugged in an electronic sound board! This digital piano will mimic true piano sound and is an excellent learning tool for young musicians. As with traditional Schoenhut pianos, the Digital Butterfly includes full width keys to learn proper finger placement, as well as our patented Tri Play Learning system. As an upgrade for our digital model we’re including 2 more learning systems to advance skills – Piano Key stickers that reflect the musical notes. The ability to connect apps and expand the play experience is really what sets this piano apart from all others. Download any piano learning app and the piano will play through your device! Download Karaoke app, and use the included microphone to sing along to the words on your device screen. Velocity Keys, 5 different instrument sound functions, Demo songs, and Record/Playback for up to 700 notes. Features opening butterfly style lid, 37 velocity keys and 3 separate learning systems. Other products from FOLKMANIS INC.
An endangered species worthy of attention, the MINI MONK SEAL finger puppet is so sweet and soft that she'll swim to the depths of your heart. Incredible math game with thousands of challenges and solutions. Help develop fine motor skills. Toss the dice to see what color you get, then choose an animal that have the same color as the one you rolled. The player that can balance the animals on the boat using the pincers without making it fall is the winner. The set consists of a boat, 6 pairs of animals, a dice, and a pincers. Ideal for 1 to 4 players. What can be better than science you can eat! Each kits shows you how to make your own sugar crystals or rock candy. Educational booklet includes instructions on how to do the experiment and information about how crystals grow in nature. 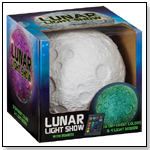 Our new interactive line of educational science kits. Each kit explores a different topic and includes an educational booklet, 40" tall coloring poster with markers and hands-on learning activities. Other products from AURORA WORLD INC. If you are looking for a great cuddle partner for your little one look no further! These adorable and ultra soft giraffes come in 8 styles in four unique sizes, each having its own interactive component including rattles, crinkles and squeakers.